The Cellar with Trolley is so versatile, you will wonder how you ever managed without one! Designed as an insulated 6-bottle wine carrier, it comes equipped with padded, removable interior dividers and a removable water-resistant interior lining both of which allow you to convert the Cellar with Trolley into a handy rolling cooler to tote your food and beverages. The exterior is made of durable ripstop polyester in solid black with a waterproof PVC base. The interior is fully-insulated 420D nylon in gray. 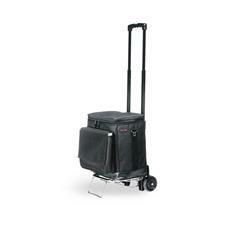 The adjustable shoulder strap has a movable comfort pad so you can carry the Cellar with ease. ThermoGuard insulation and a pearlized foil lid help keep your wine or food cool for hours, and an extra large gusseted pocket is located on the front exterior for you to store valuables or other food items. We can print any PMS color as long as an exact match is not required. Whether you're using the Cellar with Trolley to transport wine or a picnic lunch, the easy-glide wheels and telescoping handle will make your journey effortless! A very unique Executive gift.